This figure shows the SQL Editor window along with the results shown for the command executed, written in the editor (select * from nbusers). Also, you can see numerous toolbar buttons, and results are shown in similar way as if it was any CRUD application. We will discuss this in more detail in following section and follow-up blogs. 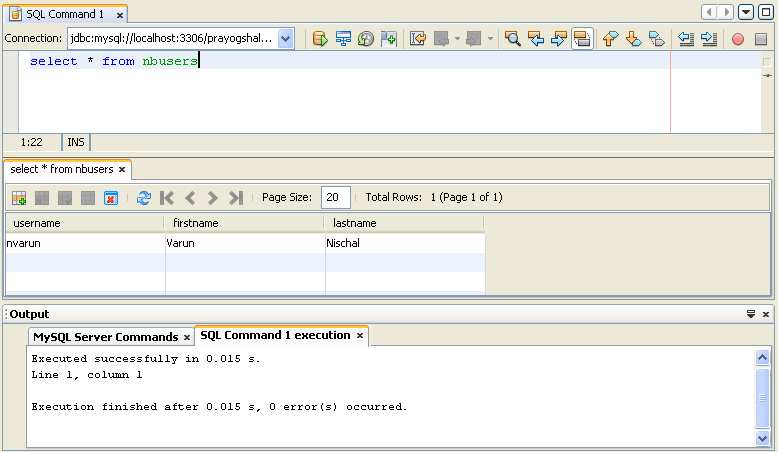 To execute any SQL query within the NetBeans IDE, you must write the necessary queries in the SQL Editor shown above. Then, you may use a shortcut key (Ctrl-Shift-E) or make use of the icon ( ), clicking this toolbar button will execute the queries against the selected database (shown in drop-down list of Connection‘s), and relevant feedback is generated in the Output window (see figure). Also, results are shown as mentioned earlier. A new database feature in NetBeans 6.5 is the ability to save and reuse SQL statements that have been executed. A dialog listing SQL statements along with the date executed can be opened from the SQL Editor by right-clicking within the editor and choosing SQL History or clicking an image button for SQL History in the SQL Editor toolbar. The order the statements appears in is descending, the more recently executed statement appears at the top of the dialog. To help search for an SQL statement, you can choose the connection for the database against which the statement was executed. This is also one of the coolest features about SQL Editor, i.e. its integrated with Database Explorer shown in Services window, goto “Window | Services” or hit the shortcut keys (Ctrl+5) on Windows Operating System to access the window. This figure shows Database Explorer on the left, while the SQL Editor on the right and Output window at the bottom of the two. 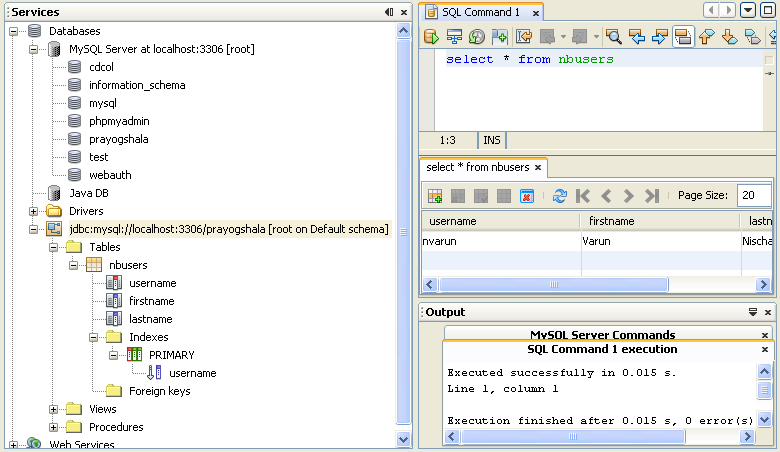 Here you could see database (created for demonstration) named prayogshala is connected on MySQL Server running on localhost. It has only one table named nbusers, which consists of attributes (username, firstname, lastname). One area that’s improved significantly in NetBeans IDE 5.0 is the SQL Editor. In fact, there never was an SQL Editor before. In NetBeans IDE 4.1 — and the releases before that — you had a very small space where you could type SQL commands for sending to the database. Also, you could read more about the SQL Editor and related features from “David Van Couvering’s blog”, Embedding of SQL Editor support into PHP Editor from the “NetBeans PHP Team’s blog”. Finally, don’t miss out on the award-winning plugin (PL/SQL Editor) created during NetBeans Innovator Grants. This is in fact my 150th blog entry over here. Indeed, its a special one! So, this was just a brief overview of the features currently supported by NetBeans IDE. The follow-up blogs will continue to focus on either some/all of these features in detail. I have been busy lately thanks to my internship project, which almost got screwed up. I was working in a team of 4 people, where we were building a web application, that was initially deployed at JBoss Server using JBoss Eclipse IDE (old version). Also, we had to interact with the centralized Oracle Server to setup our database for running the website. Now, having being trained on some of those technologies in past few months, I thought it won’t be much of an issue. However, at the beginning of this month, I faced some weird issues which had no obvious answers. There weren’t any silly mistakes either. We were facing some issues with Oracle connectivity. I am not blaming Oracle or the company where we did the project. But, mix of old and new technologies, turned out to be quite confusing resulting in lot of trouble. We were running out of time, so we decided to migrate our database to MySQL Server and use NetBeans 6.5 IDE, instead of old version of Eclipse. In the last 2 weeks, we were changing IDE’s, Servers and what not? After surpassing many hurdles, we completed the project and deployed it on the intranet with no issues. Servers: Apache Tomcat 6.0 Server running on one system, while the MySQL Server 4.x running on some other system. Although, we faced many hurdles while we strive towards the project completion, I picked up many skills and learned many tricks to speed up the development. It was an amazing experience and certainly enriching one! Stay tuned to my blog to learn a few. Also, I loved using SQL Editor provided by NetBeans IDE, it was so easy to manage the databases. Whenever you “Execute Command…” any SQL query, the data shown in form of the table is basically a CRUD application. It looked like the Java Application, you could have made using Swing Application Framework in NetBeans IDE. 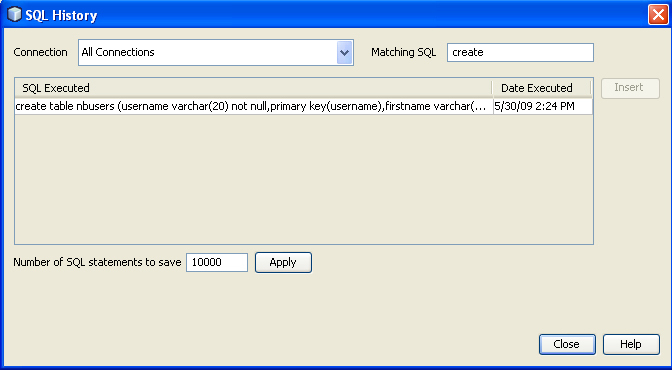 In the following blogs, you would get to know more about SQL Editor. Now, internship is over and I am back in my home town. Recently, I had asked a question on NetBeans Forums on the “Deploy-on-Save” feature supported by NetBeans 6.5 IDE. Well, I know I can’t configure build script in such a way, so that it can deploy on save. However, I found a trick to deploy the war file everytime I build OR clean and build . This trick will save your time and do lot more stuff with an existing shortcut, which you might have missed otherwise. Actually, I was working on a “Dynamic Web project” in Eclipse IDE where I was supposed to make use of its 2.0.0.Beta2 version using JBoss 4.0.5 GA (with Java EE Platform set to “J2EE 1.4” ). Eclipse was so slow and its editor support for JSP pages was doing no good. Probably, if I could have used a new release of Eclipse, then that might have helped. Still, I am not sure, its just an assumption. Also, everytime I made changes I had to first right-click project node, then select “Run As > Run on Server” and if I made any changes during runtime, it was not deploying automatically. Although, “Project” menu showed project to be build automatically . So, I had to repeat the cycle again and again. Due to the above stated issues/problems, I decided to import the complete project into NetBeans 6.5 IDE. Import was successful and I added the JBoss server into NetBeans IDE (“Tools > Servers” ). Now, project is successfully building and deploying. Its absolutely working fine. Now, NetBeans 6.5 didn’t supported “Deploy on Save” feature for the web applications that were using JBoss Application Server (I am referring to the above release), as per my recent observation. Then, when I made changes to the webpages in the earlier mentioned project, I still couldn’t deploy on save/build. So, I had to right-click the “Project Node” and click “Deploy”. This cycle is shorter one, still frustating if one makes changes frequently. Now, whenever you do “Shift-F11” or “F11”, it will “clean & build” or “build” respectively and then, deploy the project to the server. The moment you use “Shift-F11” or “F11”, the project will deploy the “war” file, however it will not run the browser for you, as it was doing earlier. If you have better solution, or encounter some problems, do let me know. Hope this helps.